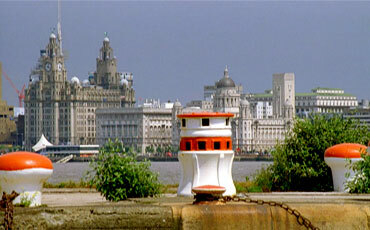 The image shows the Liver Building at the Pier Head, on the waterfront. The clock is apparently the largest clock face in the country, larger than Big Ben. The actual Liver Bird sculptures atop of the building were designed by the German sculptor Carl Bartels. Originally I come from the Gateacre / Woolton area. I went to Woolton County Primary School, Out Lane and Quarry Bank Grammar School (now Calderstones School), Harthill Road, Allerton. Study as a mature student at Riversdale College of Technology meant I eventually left Liverpool and now live in Portsmouth. My grandparents lived next door to Bill Shankley, who moved into 30 Bellefield Avenue, West Derby. Originally when he came to Liverpool, the team was still in the Second Division, and he continued to live in Bellefield Avenue even when Liverpool FC became more successful. At Woolton C.P. , I was in the same class as Christine Paisley, daughter of Bob Paisley, who at the time, was Liverpool's trainer and well-known locally although I don't know whether his name was well-known generally. He lived in North Manor Way, but later moved. At Quarry Bank, I was a contemporary ( or possibly near contemporary ) of a few "famous" people. Joe Royle was there, or had just left maybe, while I was there. Also there were the sons of Billy Liddell, and Shelagh Ratcliffe, a well-known swimmer. The only person I knew well by sight, although he never knew me, was Steve Coppell - he played football for Liverpool Primary Schools, so was already "well-known" before arriving at Quarry. Quarry Bank was also John Lennon's old school - the Beatles were originally known as the Quarrymen, although the connection of this name with the school is probably a bit exaggerated. At best, I am inclined to believe (with no actual evidence as such!) that it was possibly a dual assignation, suggested both the school and by Woolton Quarry (and associated Quarry Street) close to John's home. Quarry Bank was quite a progressive school at the time, under the headmaster Mr. Pobjoy. As an indication of how things have gone downhill, I could mention their current involvement with the the infamous Jarvis construction firm, who are re-constructing major sections of the school despite killing several passengers in the Potter's bar rail crash and despite their major involvement with the Hatfield rail crash, where work on replacing a defective rail was delayed until it was too late. The reality is that five Jarvis-run schools failed to open at the beginning of this term, leaving parents' plans in tatters and pupils' education disrupted. Subcontractors walked off the job when Jarvis failed to pay them, and the schools are still building sites. I got 'caught up' in the high-unemployment which blighted Liverpool more than many places in Britain. Further, or maybe because of, I had to fight Liverpool Council to try and get the type of qualifications that I think I can achieve. This fight, to my mind, had the effect of greatly derailing my ambitions and are a current source of 'unhappiness'. Details are here, if you are in a position to offer any assistance. Boris Johnson shouldn't apologise to Liverpool for the Spectator leader," Euan Ferguson wrote in the Observer on 17 October. "He should apologise for remaining a member of a political party which deliberately tore the heart from that city and made it the vulnerable self it is today." But if everyone who offends Liverpool had to go on a penitential pilgrimage, half of Fleet Street would be on the next train to Lime Street. Including, er, Euan Ferguson - who on 20 October 2002 wrote this attack on John Lennon: "It could be argued that it was his narcissistic emoting, never shot through with the tiniest ray of intellectual rigour, which began the Liverpudlianisation of Britain and turned us into a country that fills its gutters with tears for girls we've never met." 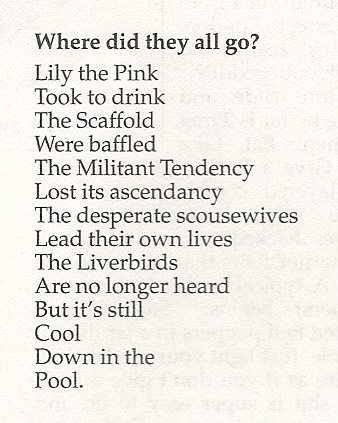 That resonant coinage "Liverpudlianisation" had first appeared, again in the Observer, on 5 October 1997 when Jonathan Meades argued that Tony Blair's religiosity "accords perfectly with the Liverpudlianisation of Britain... no-holds-barred self-pity dressed as grief, self-congratulatory sentimentalism, an affirmation of itself through the appropriation of cosmetic Celtism". The Observer's sister paper, the Guardian, has given Boris Johnson a thorough kicking over the past fortnight. It condemned the Spectator editorial as "insulting" and "vile". 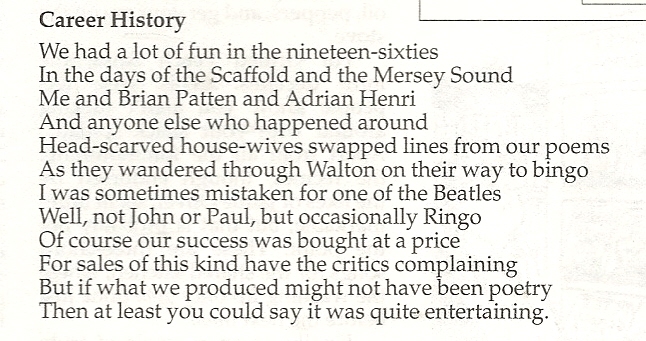 It also dispatched Ed Vulliamy to write a piece about how great Liverpool and Liverpudlians are. 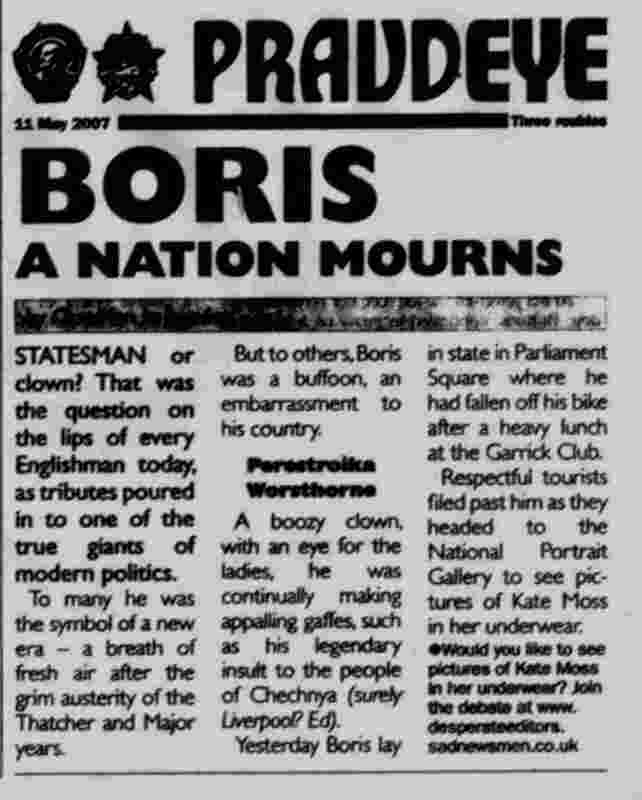 But amid all its sanctimonious tut-tutting over Boris's idiocy, there was no mention of the Grauniad's own articles on Liverpool, such as this from 24 May 1993: "The royal family has taken its whacks with a certain decent cheerfulness, something which compares interestingly with the intimidatory self-pity issuing from Liverpool if anyone suggests that idle, violent city is, well, an idle, violent city and not a citadel of delightful Scouser wit and defiance." All a long time ago, of course. But surely the Grauniad can't have forgotten the column it published by Charlotte Raven on 26 June 2001? "Scousers' propensity to linger over every misfortune until another comes to replace it makes them uniquely suited to the demands of the Bulger mourning marathon," she wrote. "While other cities might have faltered and found something else to distract them, Liverpool's talent for nursing resentments ensured that it would feel, eight years on, just as enraged about Bulger's murder as it was the first moment it heard." Liverpudlians, she added, refuse to let anything go" as long as there's still a drop of righteous indignation to be squeezed". A few days later, after a deluge of protest, the readers' editor announced that Raven's piece should never have been printed. Yet, oddly enough, it can still be found on the paper's website. Perhaps the Grauniad assumes that Scousers are too poor or thick to have the internet. Another newspaper which has shown Boris Johnson no mercy is the Times. Andrew Pierce warned that the Spectator's "ill-judged attack on Liverpool" had caused "grievous offence", while Michael Gove denounced it as "a misjudgment of quite stonking proportions". Clearly the Times would never do anything so rash as to generalise about Scousers. Except that on 23 April 1989, after the Hillsborough disaster, it printed a column by Edward Pearce arguing that "the shrine in the Anfield goalmouth, the cursing of the police, all the theatricals, come sweetly to a city which is already the world capital of self-pity. There are soapy politicians to make a pet of Liverpool, and Liverpool itself is always standing by to make a pet of itself. 'Why us? Why are we treated like animals?' 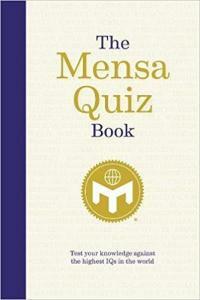 To which the plain answer is that a good and sufficient minority of you behave like animals." Four years later, Walter Ellis covered the Bulger murder for the Times. "Liverpool lives on emotion; fears and hatreds bubble constantly below the surface," he reported on 19 February 1993. "The mob, as self-pitying as it is self-righteous, is a constant presence, whether on tour in the Heysel Stadium, Brussels, or at home among the social dereliction of Liverpool 8, or as this week in the back streets of Bootle." A 2,000-word Times feature by Michael Henderson on 21 November 1998 described Liverpool as "a city that often gives the impression of wearing its decline as a badge of honour". Henderson also quoted Alan Bennett, who had written of Liverpudlians' "built-in air of grievance" and the "cockiness that comes from being told too often that they and their city are special". All these people must now apologise - as of course must the Sunday Times, which on 28 February 1993 ran a huge feature by Jonathan Margolis under the headline "SELF-PITY CITY". After watching lynch-mobs throwing rocks at police vans containing the two boys accused of murdering James Bulger, Margolis denounced the city as a "paranoia theme park" with a "self-pitying and incipiently barbaric culture". 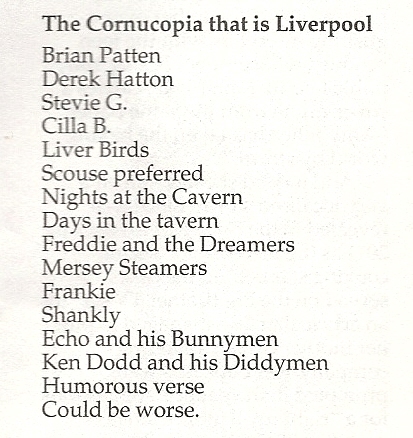 But what do Liverpudlians themselves think of it? On 16 October the Liverpool Daily Post published an open letter to Boris Johnson from its editor, Jane Wolstenholme, attacking his "outdated, breathtakingly unfair [and] just plain unpleasant" comments about Scousers. "1 do not recognise any 'flawed psychological state' in the people of Liverpool," she declared. "Contrary to the image you present of paranoid, self-pitying and defeated people, the Liverpudlians I meet are self-confident, optimistic, proud of their heritage and looking forward with enthusiasm to a more prosperous future." So Wolstenholme would presumably have no truck with someone who called Liverpool a "whingeing" city. This is the word used only last month by none other than Sir David Henshaw, the chief executive of Liverpool City Council. At a conference marketing Liverpool as the 2008 European city of culture, he admitted that "sometimes it can still be the most mind-bogglingly awful and whingeing place, where the glass is always half-empty". Was Henshaw forced to march through the streets in sackcloth and ashes? Not at all. An editorial in Wolstenholme's Daily Post on 15 September praised the "disarming candour" with which he had spoken: "Sir David has aired opinions which may leave some people feeling slighted, even wounded. But if it goads them into action, not one word has been spoken out of place." Hacks and politicians should take note. Say that Scousers have a peculiar psyche and you'll never hear the end of it. Call them mind-bogglingly awful, however, and even the Liverpool Daily Post will congratulate you. As long as you're a Scouser, of course. MORE than one million people tuned in to BBC2 on Valentine's night to watch The Sun Says Sorry, a documentary following Sun managing executive Graham Dudman to Liverpool where he attempted to apologise for his paper's coverage of the Hillsborough disaster in 1989. Around 1.1 m viewers saw members of the Hillsborough Family Support Group voting not even to grant him an audience, let alone accept his apology. But curiously, staff at the paper itself appeared to have watched a different documentary - one in which the apology was whole-heartedly welcomed. "Two leading members of the Hillsborough Family Support Group - set up after the soccer stadium disaster - yesterday publicly accepted The Sun's apology for mistakes in an article 16 years ago," the paper reported the morning after the programme. 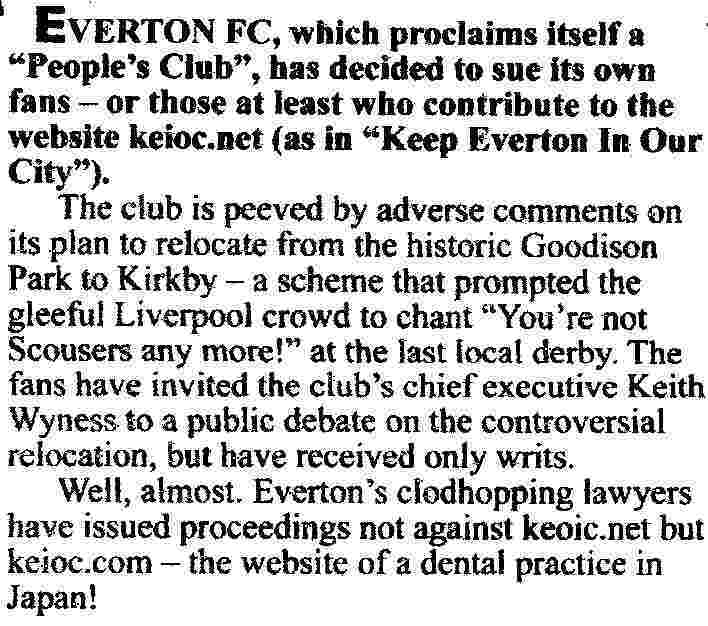 "They told Radio Merseyside they accepted The Sun's apology for causing hurt and pain." Naturally it was only lack of space which meant that the official response of the rest of the support group went unrecorded in the paper - as did the dozens of other calls the station had received, the vast majority suggesting exactly where the Sun could stick its contrition. ASTONISHING scenes at the Liverpool-Arsenal FA Cup match on 6 January 2007, broadcast live on BBC1. Thousands of fans on the Kop held up coloured cards spelling out, in huge letters, "THE TRUTH", and for the first six minutes of play the crowd kept up a deafening chant of "Justice for the 96". Several placards proclaimed: "Kelvin Mackenzie is a liar". Eighteen years after the Hillsborough disaster, in which 96 people died, the former Sun editor hasn't been forgiven for his front-page story "THE TRUTH", which alleged that Liverpool fans had been robbed and urinated on by fellow-Scousers even as they lay dying. Kelvin further inflamed the animosity last month by saying he had apologised at the time "only because Rupert Murdoch told me to. I wasn't sorry then and I'm not sorry now." Though the protest was widely reported elsewhere, the Sun's lengthy match report ignored it. Alas for Rebekah Wade, several Anfield fans made good the omission with comments on the Sun sports website, whose controller had apparently fallen asleep. "I cut my political teeth in Liverpool." - Michael Howard, Saturday 16 October. I don't expect, but do appreciate any donations towards the maintenance of the site. Even something as small as 1 Euro/Dollar/Pound would be gratefully accepted. Alternatively, please visit the various advertising links on this page. Liverpool has two cathedrals - a Protestant one designed by a Catholic, and a Catholic one designed by a Protestant. William Lassel, who discovered Triton, a satellite of Neptune, within weeks of the planet itself being discovered. It is open to debate, as to whether Lassell could have actually discovered the planet himself, if events had taken a different course. Liverpool 47, Socialism on Trial Liverpool's Socialist councillors, the Liverpool 47, recount Merseyside's battle against Thatcher in 1983 - 1987. This was the time when councils were being dismissed or abolished because Thatcher disagreed with the results of their elections (Nicaragua was almost simultaneously feeling the strain as Reagan disagreed with the results of their elections - Reagan's actions were publicly supported by Thatcher). Hillsborough Justice Campaign, including details of the events which lead to 96 deaths. Lusitania which plied between Liverpool and New York from 1907, breaking new records for speed - and which continued to sail between the two cities after the outbreak of war. CSS Alabama Condederate warship built in Laird's, and sunk by the USA in a battle off Cherbourg. In 1872, an international court ordered Britain to pay America a large indemnity to cover the damage caused to the American Navy by the Alabama. Some fragments from the ship are on display in the maritime museum in Cherbourg. New Brighton Tower The New Brighton Tower was 171 meters tall, compared to the 158 meters height of Blackpool Tower. Constructed about the same time, it appears to have only lasted until the 1920's although its name lived on in the surrounding pleasure grounds for longer. New Brighton This page is dedicated to the past glories of this resort, which is now a very depressing place. Liverpool Overhead Railway First elevated railway in Europe (apparently), but demolished in 1956. Due to the development in the docks, the tunnel at the southern end into which it traveled as far as Dingle Station, can be seen fairly clearly. Bold Street was formerly a 'ropeway', and is therefore long and straight (just like the Reeperbahn). The name of an adjacent pub celebrates this history. At least one of the parallel street was also a ropeway in former times. The grey barnacles which were formerly prominent on the Mersey (and are still to be seen despite the native form making a bit of a comeback) stem from Australasia, and were transported to the Mersey during the period of the Second World War. UM Well it's all that incessant talking they do, all that relentless cracking of funny jokes, all that smiling and laughing, all that unrelieved cheerfulness in the face of adversity. It's an affront to the North. UM Well, because it gives us a bad name. UM To make sure you don't succumb to catarrh and terminal cheerfulness. C Well we'll go to the museum then. I suppose Liverpool will still be there next year.